You can drastically improve studies with mind mapping. Studying at any age can result in mind overload unless a good work ethic is followed. Mind mapping techniques provide good ways to do this. Mind mapping put you on the right track in the right manner. You can organize yourself with the aid of charts. Diagramming techniques can be used to create charts for concepts and note-taking. You will find these techniques to be good study tools to help you to absorb more information. This, in turn, will improve grades and help your academic career. How to Improve Studies with Mind Mapping? Mind mapping is all about visualizing solutions. You bring a problem and by following certain rules make a visual diagram (map) of the steps required to solve that problem. 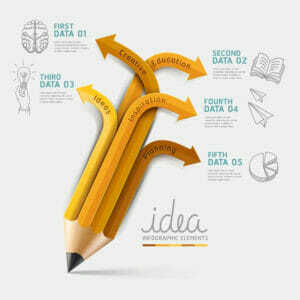 Charts made by mind mapping techniques can help you to develop good study habits. They say a picture is worth a thousand words; indeed it is but it cannot only be used to show a scene but solve problems as well. To improve studies with mind mapping we use exactly this principle, you draw the mind map, that map is an image, you look at that image and it imprints in your memory, which you can recall anytime perfectly. by using mind mapping techniques your note-taking skills will improve you will spend less time writing, you will be drawing most of the times and you will take less time to compile notes. “By noting down only keywords, you save vital time while studying. Also, when you go on to write essays or study for exams from your mind maps, you will recall the most important information1.” You will improve grades as it is easier to memorize charts rather than conventional notes. These charts will be good study tools as you can reference them quickly before an exam or test. You will organize your time better as you map out your study strategies. For essays and academic papers, you will be able to use diagramming techniques to make charts and brainstorm ideas and this is how you will improve studies with mind mapping techniques. With these mind mapping techniques, you will be able to prioritize tasks and expand on ideas. This will help you to be able to improve grades as you study better. These techniques will assist you in making creative ideas that can be clarified with these study tools. Charts can be compiled with software and diagramming techniques to improve your academic progress, this will not only be time saving but efficient as well.